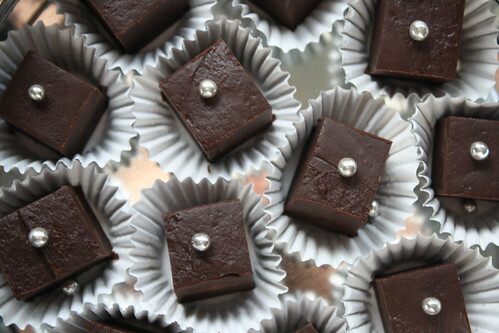 This creamy chocolate fudge is seriously beyond easy. 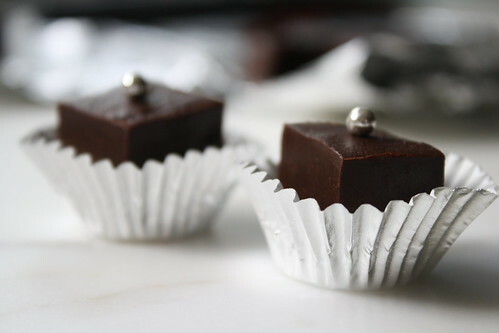 I have had this recipe for forever and it never fails to create a simple and delicious holiday treat. 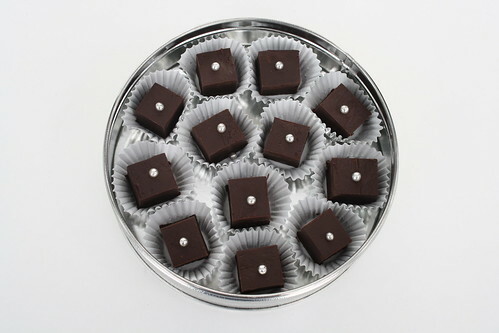 By nestling the small pieces in lovely little foil cups that make them feel like little jewels. 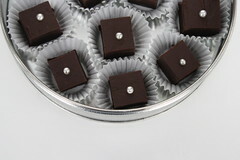 I also like to place a single little silver dragee (or gold) on the top of each piece. 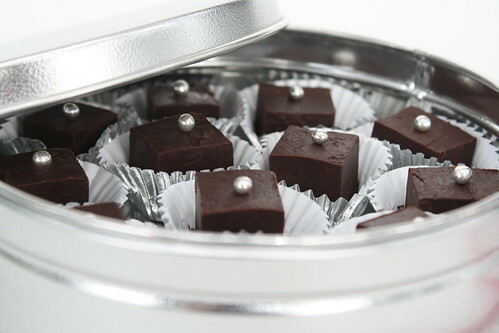 Then I will put a bunch of the fudge pieces in a tin, and they have the same effect as truffles! 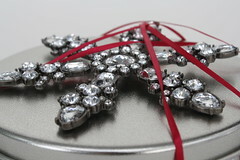 These make a really pretty gift, or are lovely to cluster in a dish for your next Holiday gathering! 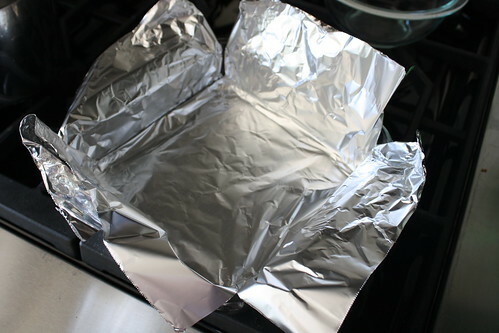 1) Prepare a 9×9 glass pan with tin foil that overlaps the sides by an inch or two. 3) In medium saucepan, melt all three ingredients together over low heat. 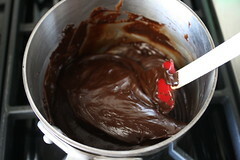 Whisk to combine them into a smooth fudge. 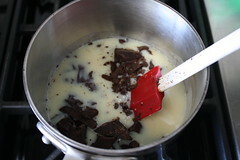 4) Pour the fudge into the prepared pan, gently smoothing it with an offset spatula. 5) Place the pan in the refrigerator until firm, about an hour. 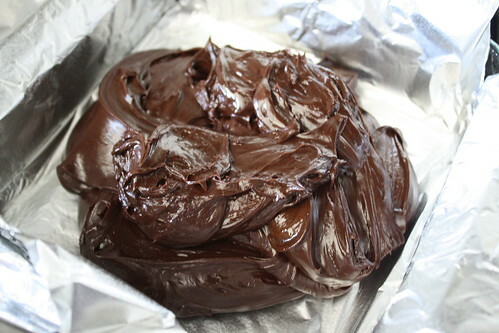 6) Pull the fudge out by the foil overlaps. 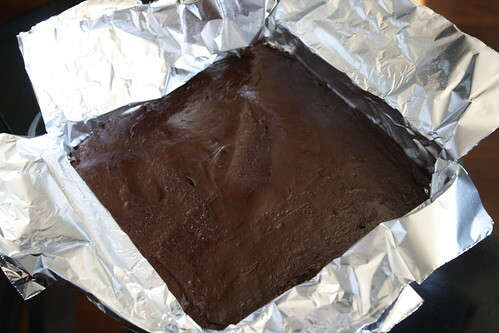 Place on a cutting board, and peel the foil from the sides of the fudge. 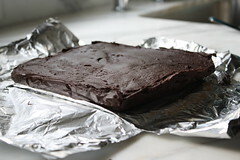 Trim the edges and cut the fudge into pieces. 7) Top with dragees or sprinkles if you desire. Place them in mini-muffin liners for a fancy touch! Oh that fudge looks so good! And with that few ingredients- I have no excuse not to make it! 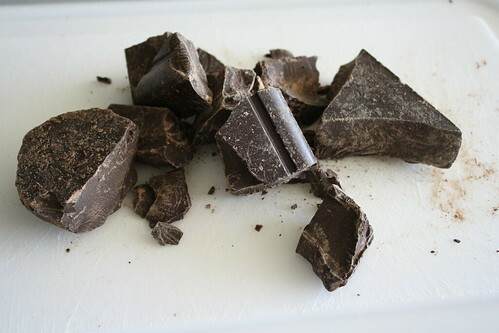 I bet the darker chocolate makes it very rich tasting. 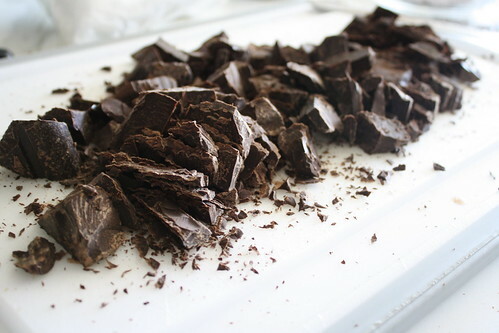 it definitely takes it to another level with that dark chocolate! This sounds so yummy! Love this idea for a Christmas treat! I can’t believe the simplicity of this recipe! Dare I say, I may actually make fudge this Christmas. Thanks for sharing your recipe. A couple years post college, I gave it a shot and LOVED making it. It was so easy. Thanks for sharing this special recipe. Such pretty holiday treats! 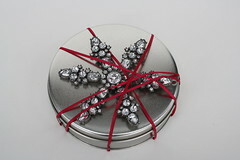 Love the way you packaged them & the little silver dragees. Gorgeous fudge and a huge congrats on the People feature! So cool and well deserved! 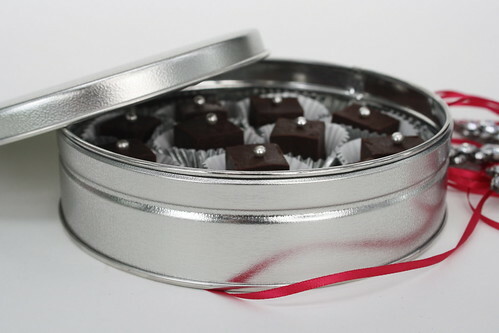 Gorgeous all wrapped up in that tin! This is just gorgeous Heather – I love the presentation and the packaging – wish I was on your gift list! That fudge looks so rich and amazing! That fudge is making my mouth water! It looks so good that I almost want to lick the screen on my laptop. lol! that is great Cathy! loving the little sparkling thing on top! so festive! My sweet neighbor I grew up to next door always made the neighbors her delicious homemade fudge for Christmas … she is now 95 years old (!!) and doing great still … and every time I hear of homemade fudge, I think of Dorothy! 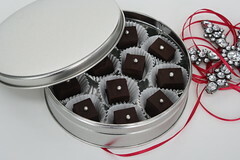 I love the silver dragees on top – just dresses up those brown squares! 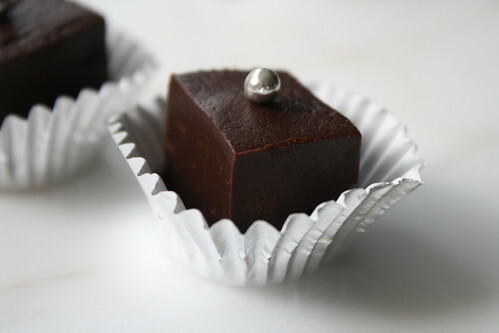 I have never made fudge, but maybe now I have a easy recipe’ you say … I will attempt my first fudge and share with Miss Dorothy! Oh my! This looks fantastic. I love the pearl dragees on top! 3 ingredients??? LOVE!!! More, More, More of these kinds of easy quick recipes for the holidays! Please?? 3 ingredient holiday gifts? I’m sold. 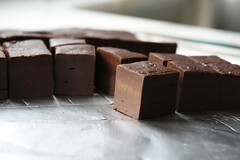 Over the weekend I made this fudge..it was creamy, smooth and DELICIOUS! I’m tossing my go-to family recipe and replacing it with yours..thank you for a wonderful new “family” recipe.